Get to know "The Porch Window Guy" of the Twin Cities. Brandon Williamson, owner of Sunspace Twin Cities, has a lifetime of experience in home improvement, construction, and customer service, starting with work at his grandparents' hardware store in his youth. After establishing a successful construction company building decks and porches for homeowners in the Twin Cities, Brandon recognized some limitations in the new outdoor spaces he was creating. Many of the screened-on porches were only used during warm weather – on sunny days with no wind. Add to that, the spaces were open to the elements and required constant cleaning. "I searched for a product that would make this space a little more useful without sacrificing the “outdoor feel” of a screened-in porch." 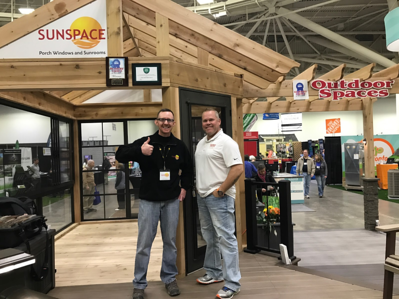 After looking at dozens of products, Brandon came across Sunspace Porch Windows and started buying them to install into his new porch projects. His confidence in the products eventually led to managing the Twin Cities market for Sunspace starting in 2009. Since then, Brandon has shifted away from building to focus full-time on providing Sunspace Porch Windows for homeowners looking to upgrade their porch as well as building contractors who are looking for uses in their new porch building projects. "Brandon was very professional and stayed to the timeline that he promised us. We hope to work with Brandon in the future on other projects. It's hard to find a reliable contractor, but Brandon was a rare find." "Brandon planned and executed our porch addition beautifully! From the first meeting to the final walk-through Brandon was easy to communicate with, amenable to changes, ready to answer questions and highly responsive." "I've now finished two 3-season porches with Sunspace 4-track windows and screens. We love the product and Brandon is excellent to work with. He worked with us from design and layout to quoting and ordering, and he did the installation. If something was not quite right, he made it right."